All too often, one of the great pains of rewards redeemers everywhere is actually redeeming their rewards. Between brand restrictions, blackout dates, and variable redemption rates, it can be a daunting task to use rewards at all, let alone maximize them for the best value. For those who tire of the challenge of trying to redeem travel rewards, the No Hassle Rewards® offered by Capital One are a breath of fresh air. With no blackout dates, brand restrictions, or other hoops to jump through, these travel rewards are definitely among the simplest to redeem. But what about earning them? That’s where the Capital One® Venture® Rewards Credit Card and the Capital One® VentureOne® Rewards Credit Card come into the picture. As sibling cards that both allow cardholders to earn miles on every purchase, deciding between the two options will come down to your personal credit card habits. Being that the main draw of the two cards is the rewards they offer, let’s dive right into it. The Capital One® Venture® Rewards Credit Card is the more rewarding the two cards, offering cardholders 2X miles per dollar on all card purchases, with no rotating bonus categories to keep track of and no limit to how many miles you can earn. 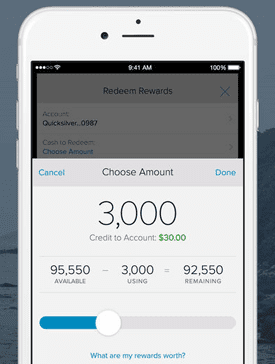 Since Capital One travel miles have a flat redemption rate of 1¢ per mile, the Capital One® Venture® Rewards Credit Card has an effective rewards rate of 2% for all purchases. With a $95 annual fee (waived for the first year), you can break even by making at least $4,750 in purchases with your card each year — which comes out to less than $400 a month. If you don’t spend enough to make the annual fee worthwhile (or simply don’t care to pay one in any case), the Capital One® VentureOne® Rewards Credit Card offers annual-fee-free No Hassle Rewards®. While you’ll earn at a lower rate — 1.25X miles per dollar, or a 1.25% return — paying no annual fee means you’ll earn $60 worth of rewards while Capital One® Venture® Rewards Credit Card cardholders are just paying off their annual fee. In addition to regular purchase rewards, both the Capital One® Venture® Rewards Credit Card and Capital One® VentureOne® Rewards Credit Card cardholders will also earn 10X miles per dollar for purchases made through Hotels.com/Venture with their card. You must pay for your stay at the time of booking to earn the bonus miles and this offer is valid through January 31, 2020. Given the rewards differences, it’s natural to consider at which point the cost of the annual fee is worth it for the extra rewards offered by the Capital One® Venture® Rewards Credit Card. With 2X miles per dollar, Capital One® Venture® Rewards Credit Card users will pay for the annual fee after around $4,750 in spending, and they will start to out-earn Capital One® VentureOne® Rewards Credit Card cardholders after $12,672 in annual card purchases, or about $1,056 a month. While the two cards earn miles at different rates, redeeming those rewards is the same simple process for Capital One® Venture® Rewards Credit Card and Capital One® VentureOne® Rewards Credit Card cardholders alike. After logging into your online account, you can go to the rewards page and choose your redemption option. So far as travel goes, miles can be redeemed as a statement credit for eligible purchases you’ve already made or can be used to book new travel. Out of travel expenses to reimburse? You can redeem your miles for gift cards for popular merchants, such as Amazon.com, at the same redemption rate of 1¢ per mile. For users who frequent one of Capital One’s partner airline loyalty programs, a lot of value can be had by transferring your miles to an eligible frequent flyer account. This allows you to pool your rewards with existing frequent flyer miles to put toward free travel. If nothing else appeals to you, Capital One® Venture® Rewards Credit Card and Capital One® VentureOne® Rewards Credit Card miles can also be redeemed for straight cash back via a statement credit or mailed check. This is the least recommended redemption option, however, as you will only get 0.5¢ per mile when redeemed for cash back. 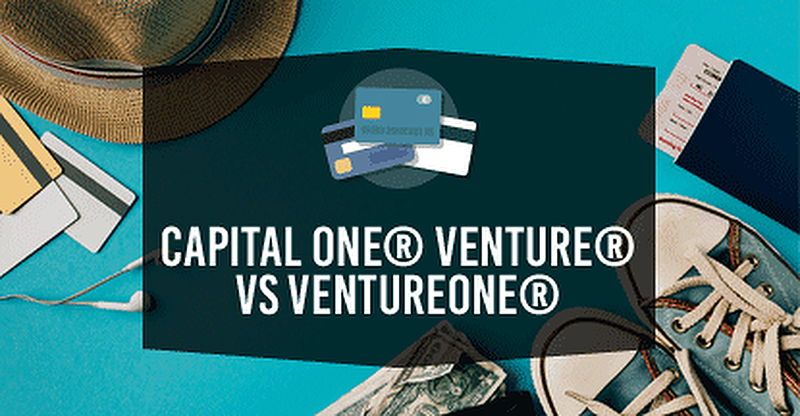 If you’re still on the fence between the Capital One® Venture® Rewards Credit Card and Capital One® VentureOne® Rewards Credit Card, then the size of their respective signup bonuses may just tip the scales. That’s because theCapital One® Venture® Rewards Credit Card offers a signup bonus more than twice the size of its little sibling — though the spending requirement is also more than twice as big. Based on the flat-rate 1¢-per-mile value of the rewards, the Capital One® Venture® Rewards Credit Card card’s signup bonus can more that make up for the card’s annual fee (and do so for a few years, at that). Since the card’s annual fee is waived the first year, the signup bonus can put you well into the black for quite a while. Cardholders can get 24/7 access to their Capital One® Venture® Rewards Credit Card or Capital One® VentureOne® Rewards Credit Card account through the Capital One mobile app. At the same time, the easier-to-get signup bonus of the annual-fee-free Capital One® VentureOne® Rewards Credit Card means you’ll start out ahead — and stay that way. The more attainable spend makes the Capital One® VentureOne® Rewards Credit Card the obvious choice for anyone who doesn’t charge enough each month to qualify for the Capital One® Venture® Rewards Credit Card card’s signup bonus, as these users will also be unlikely to come out ahead with the Capital One® Venture® Rewards Credit Card card overall. Of course, the signup bonus is hardly the only extra perk available to Capital One® Venture® Rewards Credit Card and Capital One® VentureOne® Rewards Credit Card cardholders. For example, both cards can be used to make foreign transactions with no extra fees, making it more affordable to make purchases abroad. Eligible purchases can also qualify for travel accident insurance, extended warranties, and an auto rental collision damage waiver. Beyond travel, cardholders can shop with confidence using their Capital One cards thanks to $0 Fraud Liability for unauthorized card purchases, as well as the option to set up security and account alerts. And users can enjoy 24/7 customer service, the Capital One Wallet™ for easy purchase tracking, and beverage discounts at any Capital One Café. While it’s all well and good to compare rewards, all the rewards in the world won’t do you much good if you can’t qualify for the card. Unfortunately for credit-builders, however, both the Capital One® Venture® Rewards Credit Card and VentueOne® Rewards cards specify good to excellent credit to qualify. That being said, reports from Capital One® Venture® Rewards Credit Card cardholders seem to reflect a higher average credit score among approved applicants. In particular, it seems the typical Capital One® Venture® Rewards Credit Card cardholder reports being approved with a credit score around or above 700, though there is the occasional review of someone being approved with a slightly lower score. Higher credit limits appear to be reserved for higher credit scores, however, with the highest credit limits awarded to the most well-qualified applicants. If you’re right on the cusp of good credit, you may want to look at the Capital One® VentureOne® Rewards Credit Card more closely. Reports of being approved with a lower credit score are more prevalent for the Capital One® VentureOne® Rewards Credit Card than its sibling, indicating it may be easier to qualify for the less expensive card. Some reviewers report being approved for the Capital One® VentureOne® Rewards Credit Card with scores as low as 650, which is actually in the upper tier of a “fair” credit score. Regardless of your credit score, you may be turned down for either card if you already have two Capital One consumer credit cards (excluding co-branded or store cards). Furthermore, any negative history with Capital One, such as a discharged Capital One debt, can also cause your application to be rejected even if you have a high credit score. If you’re unsure of your ability to get approved for a Capital One credit card, the best way to estimate your chances is to check for pre-qualification offers. This can be done easily online using a soft credit pull, which won’t ding your credit score like the hard inquiry that comes with an official application. Since Capital One reportedly checks all three credit bureaus, pre-qualification may save you several hard inquiries. As anyone who has ever been stymied by blackout dates or other travel rewards restrictions already knows, sometimes redeeming your miles is even harder than earning them. Not the case with the Capital One® Venture® Rewards Credit Card and Capital One® VentureOne® Rewards Credit Card. Indeed, the program’s designation as “No Hassle Rewards®” is accurate, as redeeming your miles is as easy as earning them. 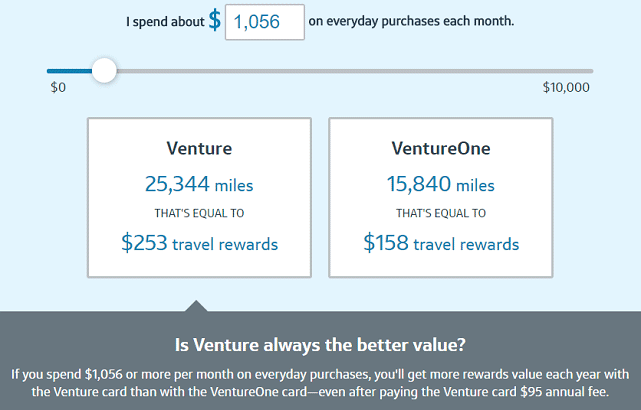 Given the relatively low earnings rate of 2% and 1.25%, respectively, the Capital One® Venture® Rewards Credit Card and Capital One® VentureOne® Rewards Credit Card don’t necessarily provide the best per-mile value available for credit card rewards, so they’re not generally the top choice of travel enthusiasts who try to maximize their rewards. For everyone else, however, either card can be a good addition to your wallet, providing a straightforward way to earn travel rewards on every purchase. As for those who are interested in obtaining both cards — there really isn’t a point to carry both cards year-round. If you’re looking to earn signup bonuses from both cards, you can certainly apply for and, if approved, open both credit card accounts. And (so far as reports indicate) you can earn both signup bonuses consecutively if that is your goal. Once you have your bonuses earned and redeemed, though, there’s really no reason to keep both cards open. Choose the one that will provide the best return and cancel the other.